The work of Modal Design, led by Daniel Monti, is at once simple and complex; resolving inherent contradictions and reconciling differences through architecture as a yet-untapped resource for a world in flux. Daniel Monti’s peripatetic youth exerts a powerful influence on his approach to the discipline of architecture in general, and his own practice in particular. Born in Venezuela to Argentine parents, his family lived in seven countries by the time he was eighteen, moving nearly every two years to locations as disparate as New York, Indonesia, Iran, France, and Texas. His experiences living indifferent countries, along with subsequent extensive travel, inform Daniel’s acute appreciation for cultural differences, and how those differences are translated into architectural forms. Daniel received his Master of Architecture degree from Harvard University’s Graduate School of Design, where he began to formulate his investigative philosophy of practice. His decision to attend Harvard was based — in part — on the curriculum, which is equally balanced between theory and practice. This notion of balance is integral to his practice and has been expanded since his time in school to include reconciling nature and the built form, the banal or ordinary and the specific, and a project’s programmatic requirements and the art of architecture. The ideas that Daniel first explored in his graduate thesis, including efforts to make the public more observant and less complacent, are the same ones that he currently examines in his practice. Much as the mission of art is the heightened awareness of the viewer, Daniel believes in the capacity of architecture to increase awareness about the choices one makes about how they interact with the built environment. Daniel is a registered architect in California with over ten years of professional experience as a principal and lead designer. 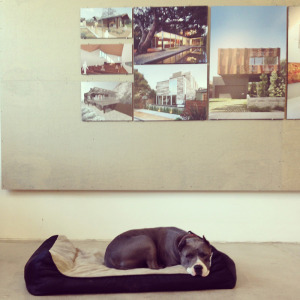 He established his architectural studio, Modal Design, in Los Angeles in 2004. The Modal Design team works together to achieve the best project. Instead of providing a client with a polished version of his first solution, Daniel begins each project with a series of investigative exercises intended to result in the best, perhaps inevitable, solution. At the outset he identifies the immediate solution and then initiates a generative process until the design evolves.The studio culture is largely experimental, conducive to productive research, and allows the best ideas to emerge from the exploration of many possible resolutions. Daniel’s tectonic approach to architecture supports innovation. When typical solutions are generally acknowledged to be unsuitable, a discovery and learning process ensues. Although each project is unique, the desire to innovate and embrace the unknown, the pairing of seemingly paradoxical elements, and the various methods of elevating the ordinary to heighten awareness are salient constants in Daniel’s design work. 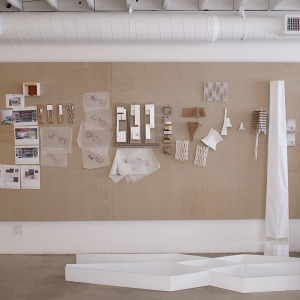 Based on Daniel’s studio model of practice, it follows that Modal Design’s ideal clients are those who are receptive to having a designer rethinking and questioning assumptions, providing the opportunity to challenge architectural norms and realize innovative solutions. Believing that a critique of existing work is a valuable part of the design process, Daniel thoroughly investigates the inherent possibilities of every project, including what has already been done, in order to push beyond the accepted conventions and expectations. As an individual and a practitioner, Daniel is extremely rigorous and disciplined and always strives to maintain the highest standards for himself and for his work, but his rigor is tempered by sensitivity. Several conceptual threads run through Modal Design’s body of work. A prominent theme that each project shares could be termed “a collision of opposites.” This collision can take many forms, depending on the program, but always adds a layer of complexity and interest. It can include the juxtaposition of elements, the relationship of a building to nature, material choices, how the element of time is incorporated into architectural design, and movement through space. Daniel creatively juxtaposes elements that are often considered banal or ordinary with the specific and extraordinary. Much of his inspiration comes from the art world. For example, in the sculptural work of New York artist, Tara Donovan, one can see parallels to Daniel’s work. In the piece to the right (below, left, etc. – include image here) Donovan has taken an everyday, generic Styrofoam cup and created an extraordinary, undulating sculptural piece that — at the very least —forces the viewer to reconsider the cup and the materials that constitute art. The realization that something as simple as a disposable cup can be employed so effectively in the construction of an intricate sculpture resembling an object that could be found in the natural environment (clouds) can be startling to someone confronted with the piece for the first time. In other words, it’s the manner in which a material is used, and its relationship to other elements, not the material itself that increases awareness on the part of the viewer. In Daniel’s work, this idea appears when materials that may, on their own, seem ordinary and perhaps even dull are placed in tension or conflict with other materials. This unusual and innovative, yet purposeful use of materials is evident at various scales in Daniel’s work. Daniel’s design work creates situations where nature and architecture are mutually reinforcing. That is not to say that they blend together, but that design decisions are made with careful consideration to site, landscape, light and climate. Sometimes this is more effective when the conditions seem to contradict each other. By contrasting textures, light conditions, color, and materials, each appears to stand out more. Because of his extensive travel, Daniel has a unique perspective of the residential typology. Exposure to a multitude of international architectural styles and modes of construction has increased the store of knowledge that Daniel draws upon in his design work. He brings an openness and receptiveness to his practice, rooted in his lifelong observations of the range of solutions that can be applied to universal architectural problems. For Modal Design, the conscious decision to avoid the appropriation or borrowing of elements from existing projects favors an abstraction of the essence of historical precedents, imbuing the work with a fresh perspective. The Walnut House, a custom residence Daniel designed for a forward thinking, open-minded client in a residential neighborhood in Venice, California, is the physical manifestation of Modal Design’s core principles and methodology. The site is in a residential neighborhood that has been in transition for several years, with small cottages interspersed with cutting-edge, contemporary architecture. A characteristic of Modal Design’s work, one that is exemplified in this house, is that the concepts of system and design are inextricably linked; system is the generator, or device for producing the design. Program, materials, and building systems are not forced on the design, but the design results from innovative interpretations of the requirements of program. Rather than dictate, systems offer freedom. When Daniel first began to design the Walnut House, one of the earliest considerations was the system that would be used in construction. He wanted to design a screen that would wrap the exterior and possibly reference a massive tree extant on the site. As he began to study the screen he realized the necessity of developing a system to achieve the desired effect without having the budget spiral out of control. Ultimately, the design became a study of the system and what the system could contribute to the design. The folded, perforated COR-TEN steel envelope is the first thing one notices when approaching the house from the street. As this screen ages and weathers,it will develop a beautiful rust-colored patina, reinforcing the concept of the house as a living architecture that changes over time. The Walnut House is designed to coexist in a harmonious relationship with nature in unexpected and inventive ways; a connection that is reinforced by the choice, placement, and function of the materials. The folded steel on the exterior is textured, perforated, and multi-colored and is a sharp contrast to the clean, white, rectilinear walls of the house’s interior. The lacey, organic nature of the steel panels further accentuates the geometric severity of the interior walls and vice-versa. The pairing of these diverse elements has the effect of reinforcing the particular qualities of each. Daniel is particularly attuned to the unique and varied site-specific light that defines a location. In the design of the Walnut House, his intention from the inception was to exploit the clear, intense sunlight of Southern California. Because this light is so plentiful, it is often taken for granted by longtime residents of the area. Daniel used several methods to alter the light and give it an almost sculptural quality and call attention to it. The COR-TEN steel casts shade and shadows on the façade that lengthen and shrink according to the time of day and degree of cloud cover. The numerous round holes of various sizes punctured in the steel screen creates a staccato effect of the natural light that penetrates the interior, casting shifting patterns of light and shade on the walls and floor throughout the day. As a result, the architecture, like nature, appears to be in a constant state of change. The Walnut House can be best understood only by moving through the space and even then, only after several visits. Starting at the front door, components of the design unfold slowly as one moves deeper into the house. The entire ground floor is an open plan with kitchen and living room flowing into one another while the second story where the bedrooms are located is a more traditional floor plan offering more privacy. The enormous tree in the back yard that has been part of the site for nearly a century is revealed in stages, only seen in its entirety from the back yard.From the entrance, just a portion of the massive trunk is visible and dappled shadows from the leaves fall on the interior walls and ceiling; further evidence of the tree’s scale. The juxtaposition of the tree and the white-walled, high-ceilinged, rectilinear space enhances the characteristics of both,emphasizing their differences and actively engaging nature. By merely hinting at the existence of the tree, anticipation and curiosity are increased. In the living room, five-foot wide floor-to-ceiling glazed panels open to the backyard and pool, creating a nearly transparent physical barrier between interior and exterior. When opened, natural ventilation cools the interior. The circulation that dictates movement is also designed as a critical part of the experience of the home; neither accidental nor comprised of leftover space, but carefully orchestrated to reveal and conceal, to offer— and at times, withhold — information. The design intentionally frames the views both out of and into the house. The Walnut House — like Modal Design’s philosophy or critical framework — is a true representation of a “collision of opposites.” By juxtaposing materials, framing views in and out, textured and smooth surfaces, solid and perforated forms, nature and architecture; he has succeeded in designing a house that has many layers, literally and metaphorically. The design and the experience are complex and characterized by a richness that is only fully revealed over time and by moving through the project.